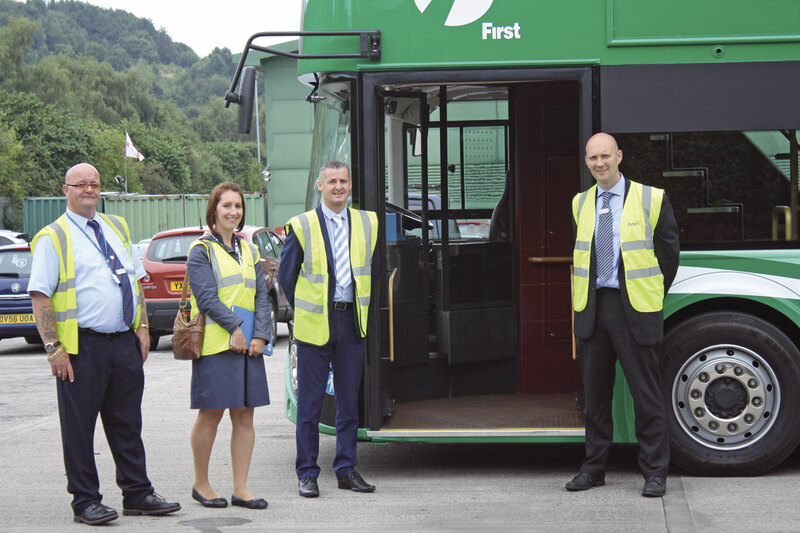 First West Yorkshire launched a consultation programme last week to showcase their plans to provide a ‘New bus for West Yorkshire’ scheme. First representatives were on hand at venues in Leeds, Bradford, Huddersfield and Halifax to present their proposals to council officials, local politicians, business representatives and community and transport groups. Kirsty Flatt caught up with them at their award winning bus depot in Huddersfield to find out more. The controversial plan for a £250m trolleybus scheme in Leeds has been well documented, and the timing of First West Yorkshire’s consultation on their plans for an extensive bus transport improvement plan, whilst the public inquiry rages on, is no coincidence. So what are their plans? First propose to launch 200 New Routemaster buses into service in Leeds as part of a project that will include smart ticketing and improvements to the road network, particularly in congestion hotspots. 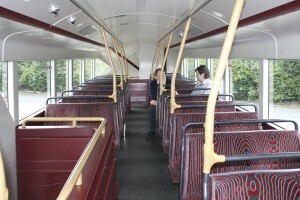 Although no official orders have been placed with Wrightbus, the manufacturer of the New Routemaster, they have an ex-service vehicle on loan for six months. After this initial consultation, it will go on tour in early September in a series of road shows around the county to gather public opinion before they plan to subject it to a number of test runs on selected routes. 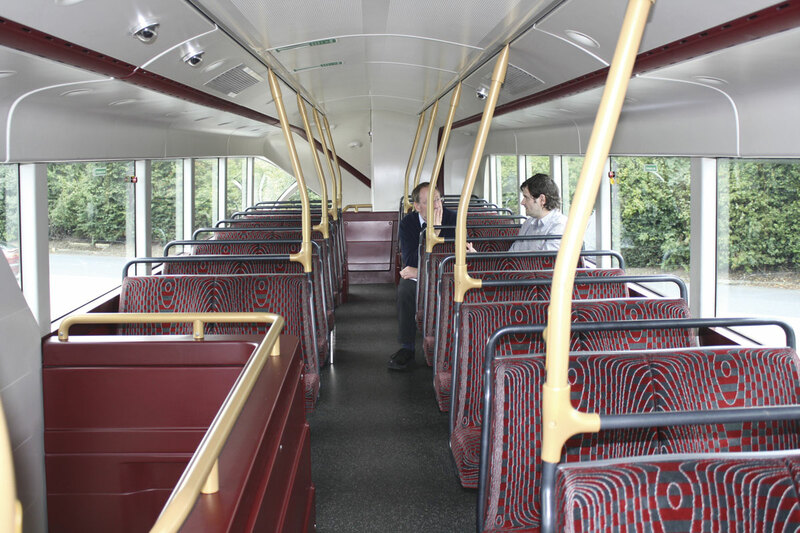 The vehicle was chosen because, in addition to First West Yorkshire having a good relationship with Wrightbus (the entire fleet in Huddersfield is Wrightbus or Wright/Volvo), the new Routemaster has multiple entry points. This is essential in their strategy for reducing waiting time at bus stops, during boarding and exiting, which is currently 25-30% of the overall journey time. By implementing a two-door system, the time saved could be put straight back in to the timetable. It is expected that only two of the three doors will be used at any one time, as they are looking for single man operation. This can be achieved by using the front and middle doors, with the plan that the wheelchair accessible central opening will be completely cashless. Cashless ticketing isn’t new to West Yorkshire, they already have the MCard which is a multi operator, cross network system that was an initiative of the Association of Bus Operators in West Yorkshire (ABOWYS) and introduced last year using smart card technology. Last month also saw the launch of their mobile ticketing app, First Bus Mobile Tickets. The MTicket is available for both android and iPhones and allows the user to purchase a ticket via their mobile phone with the details of the transaction available on screen to show to the driver. In addition to this, all concessionary passes have been replaced with smart cards. First plan to introduce a ticketing system not dissimilar to the Oyster card, with a view to going completely cashless; this will of course be a phased approach. Currently, less than half the transactions in a week are paid for by cash. Paul reiterated that it wasn’t a case of ‘picking up a London Routemaster and depositing it in Leeds. The consultation process will highlight what does and doesn’t work and what people want.’ The current model on show is a standard New Routemaster Hybrid bus with a four-cylinder Cummins engine, Siemens hybrid equipment and a seating capacity of 87, with 25 standing. 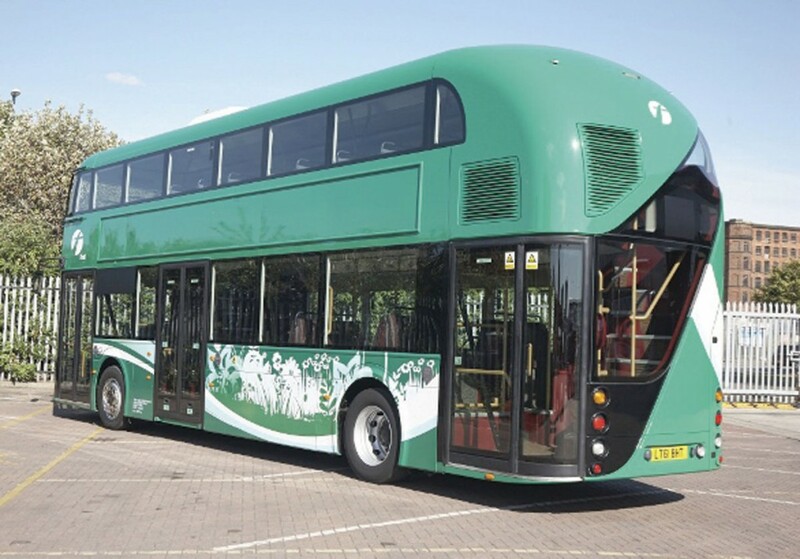 Brandon Jones, Head of External Relations, First UK Bus (North Region) explained that basically they have a blank piece of paper and the bus can be bespoke, so if they need a larger buggy area or more lower floor capacity, then these can be implemented. Areas of concern that have already been highlighted are fare dodging, blatant misuse of the break window button and passenger safety due to the dual staircases. 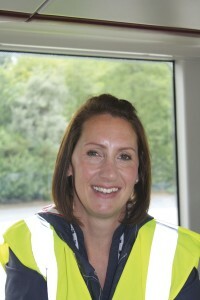 Wrightbus were able to reassure them that these had not been cause for concern whilst in operation across the capital. What was important was the environmental impact that the vehicle would have. 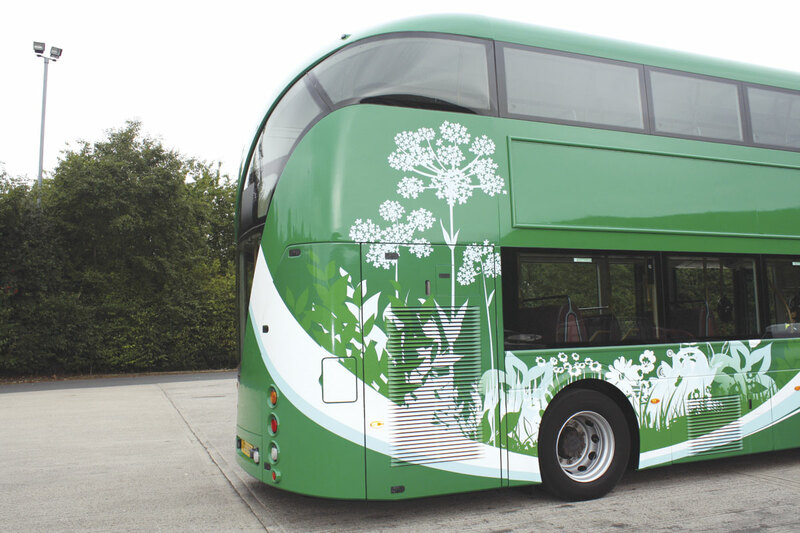 This was part of the reason for deciding on a green livery with a sweeping floral design running from the rear axle to just below the back window, as it immediately shouts ‘Green’. West Yorkshire Combined Authority has launched a Sustainable Transport Fund to encourage green travel across the region, and in conjunction with this, reducing carbon and NOx emissions and promoting cleaner air are at the forefront of First’s environmental policy. As I mentioned in a previous article (Low CVP conference, B&CB 1287) York have already introduced electric vehicles to their fleet and Leeds have a number of hybrid vehicles where the diesel engine only kicks in at a pre-determined speed. Euro6 vehicles are being introduced across the region and ten Wrightbus Streetlite Micro Hybrids will be joining the Huddersfield fleet in October from a batch of 310 that will be operated by First Group nationwide. With bus use in the region growing 2% year on year and an acceleration of new housing projects, it is important that the capacity of the vehicle meets the demands of its customers, now and in the future. With each of the New Routemasters costing £350,000 each, this is a huge investment for First West Yorkshire and they need the partnership commitment of the West Yorkshire Combined Authority, which was formed in April, to invest in the infrastructure for the proposal to work. A similar partnership currently operates in Sheffield. One of the West Yorkshire Plus Transport Fund’s key priorities is to encourage economic growth in the area and they believe that this can help to be achieved by reducing lost time caused by congestion. Congestion hot spots in West Yorkshire are a priority and improvements to the road network, changes to signalling and improvements to bus stations and stops, particularly as some of the bus stations are drive in and reverse out, are all part of the proposals. First currently use a Vix system to record ‘on start’ times and vehicle movements and with this combined investment, dwell times would be reduced and reliability would be increased. Although the 200 New Routemasters are destined to be put in to service in Leeds over the next five years, the plan is to roll them out across the whole of West Yorkshire. I spoke to Joanne Waddington, Principal Engineer, Transport Strategy Team at Kirklees Council for her thoughts on the proposals and how her team intend to support it. This statement further highlighted the fact that unfortunately there is a certain amount of stigma from higher earning groups attached to bus travel and this is something many councils and bus operators are keen to address. Because the Kirklees Council catchment area is quite diversified and includes large rural and urban communities, the task of providing a sustainable bus transport system isn’t an easy one. As part of their air quality plan they need to encourage business users out of their cars and reduce the impact on the environment. These problems are being further reduced by the monitoring of traffic queue lengths. In congestion hot spots, green lights are assessed to determine how long it shows during peak periods. These can then be adapted and prioritised so that operatives can alter the signal to improve traffic flow. This system is a simpler solution to the introduction of bus lanes and provides immediate results. That said, priority bus lanes have not been taken out of the equation altogether and may be a necessity on some routes. Another area that is being targeted is bus frequencies. On the most used routes, they want to reduce the waiting time for the next bus to less than ten minutes and the need to provide the traveller with the most accurate information is essential. They would like to be able to offer more detailed real time information at bus stops and stations and this may mean changing the current digital displays so that more text can be shown. Operators would be encouraged to advise the central control room of any major delays so that the boards could be updated as the incident occurs. Audio information systems are also being explored. The council are currently four years in to a 15 year plan to improve the network of transport hubs across 130 sites. Part of the process will include transport interchanges and this will mean better passenger waiting facilities, cycle storage and CCTV. Regular meetings are scheduled with operators so that an information exchange ensures that everyone is updated. The region covered by Kirklees Council has a large percentage of low wage earners and part of the council’s directive is to encourage the unemployed back to work. Bus ‘work routes’ have been implemented in other parts of the country and this is something that they would like to apply within the county. Providing that the council can put a business plan together to justify these new routes, by working in partnership with First, there is no reason why the New Buses for Yorkshire shouldn’t be appearing on a Huddersfield street sometime soon. Is this the ugliest vehicle in history?